SEOZEO is an established SEO consultancy based in Ankara and Istanbul, Turkey. They specialize in SEO, SEM, Online Management, and Social Media Optimization, and work with a variety of clients from Turkey, Europe, and the US. Mehmet Aktuğ is the Managing Partner at SEOZEO, and is directly involved with implementing SEO strategies and projects for many of the agency’s customers. Chip.com.tr is one of the most successful media brands on the internet in Turkey. Combining user driven content and software development, CHIP.com.tr has grown to over 12 million users per month throughout Europe. CHIP.com.tr is also managed by Dogan Burda Publishing Corp. and has been online since 1997. As an established site, online since 1997, CHIP.com.tr was in need of an upgrade. Many elements of the backend were older and developed years ago. While improvements had been made on the site, by adding updated designs, new features, and a mobile version, they weren’t completely able to integrate the updates due to the old technology still lurking. Users were still able to access high quality content, but their SEO was flawed and holding them back from attracting new organic visitors. The site contained over 100K pages with thin, or no content. There were many duplication issues, and no paginated pages. SEOZEO used DeepCrawl to deep dive into the CHIP.com.tr site. They realized that CHIP.com.tr’s existing CSS would need to be replaced – both the front and back end. As they started the transition process, Mehmet and the team used DeepCrawl to continuously monitor the URL’s and pinpoint pages that needed to be redirected. They crawled the test site and compared it to the live site, and were able to quickly find and link the 301’s from the old site to the new. To decrease duplicates, and increase organic traffic, SEOZEO added pagination. 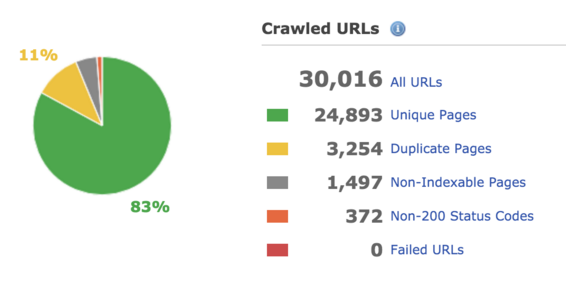 They quickly found duplicate pages with DeepCrawl, and used no-index and canonical tags to eliminate problem pages. Being able to remove duplicate and thin content issues, proved invaluable for Chip.com.tr. The team focused on the duplication problem first, and later were able to use DeepCrawl to monitor the site migration and mobile optimization. Mehmet and the team at SEOZEO love the ability to share the DeepCrawl reports, both internally and with clients. Through DeepCrawl’s sharable reports, productive and efficient collaboration is possible with little hassle. As longtime DeepCrawl users (2 years), the SEOZEO team finds the tool integrated into their daily work, and can’t image an alternative.